Sunday night I welcomed the Handsome Husband home from his annual foray into the wilderness, where he was hunting bear and eating bark and channeling Bear Grylls. He usually returns home looking like a lumberjack. And he tries to tempt me with stories of pristine wilderness and mist covered lakes. I will not be fooled into joining him. But I digress. I figured something hearty and home-style would be a nice treat to welcome him back to civilization. And coax him into shaving. Shepherd’s pie fit the bill. 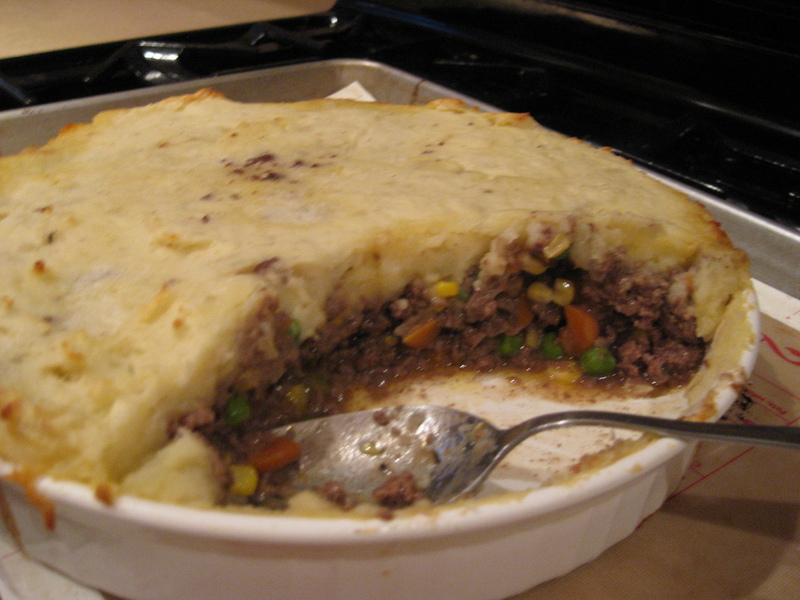 Shepherd’s pie is an English favorite, served in pubs all over their craggy hillsides. 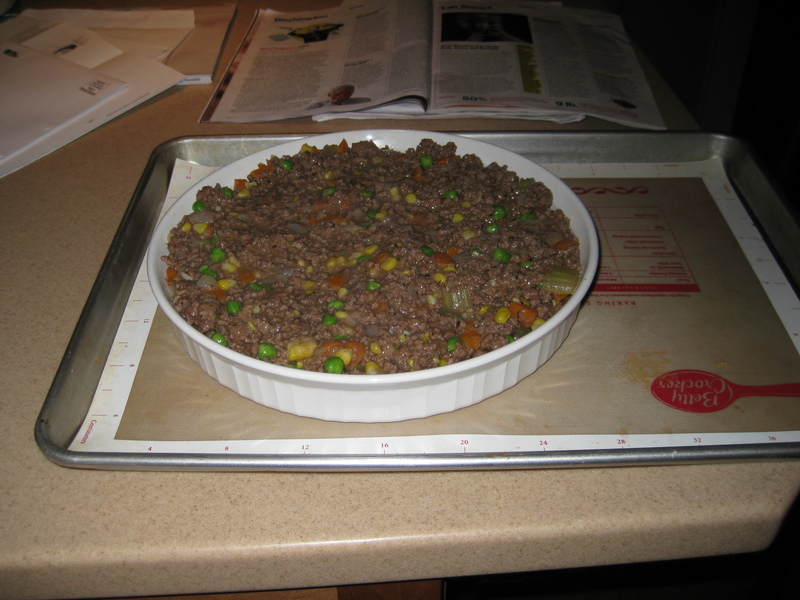 A filling is made of ground meat, cooked with vegetables and lots of seasoning in a deep pie dish. Then the “crust” of mashed potatoes goes on top. There are easy recipes for the pie here and here and here. All have subtle variations, but the same general assembly and methods. 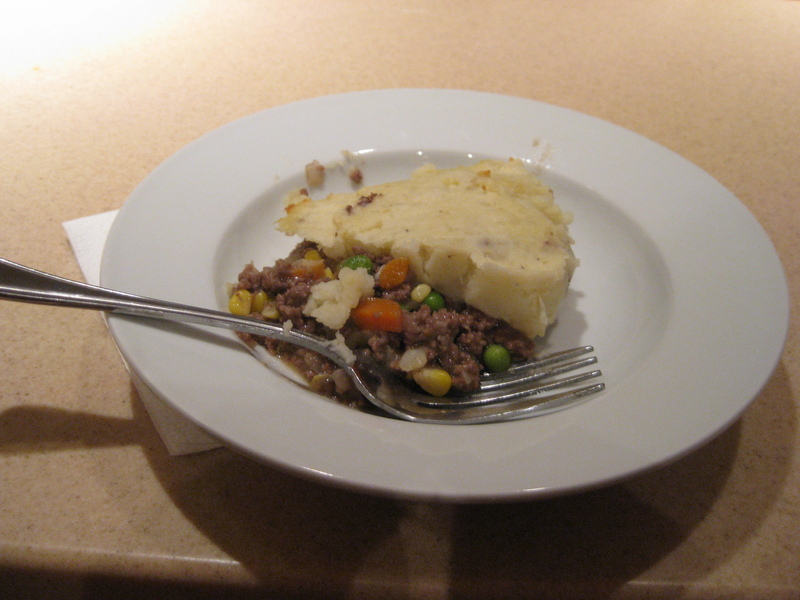 Disclaimer: For those keeping score, Shepherd’s Pie is actually made with ground lamb, therefore I technically made “Cottage Pie”, which is the same thing just using beef instead of lamb. I began by making mashed potatoes: boiling, draining, adding cream and butter, and mashing. Tip: this recipe would be a FANTASTIC way to used leftover mashed potatoes. If you’re like me, you have trouble making leftover mashed potatoes re-edible. Shepherds probably have this same problem. Next up is the filling. Cook the onion and carrots until softened then add the garlic. 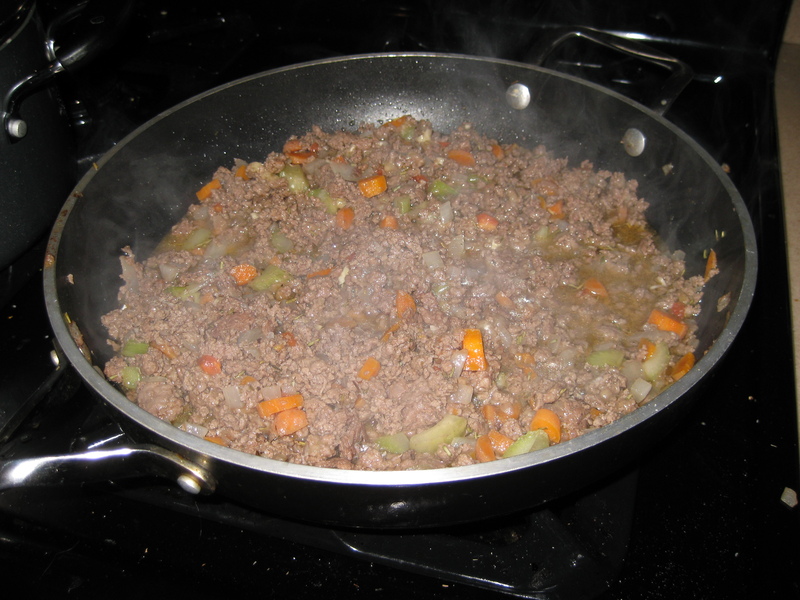 The ground meat goes in next and you cook until browned. 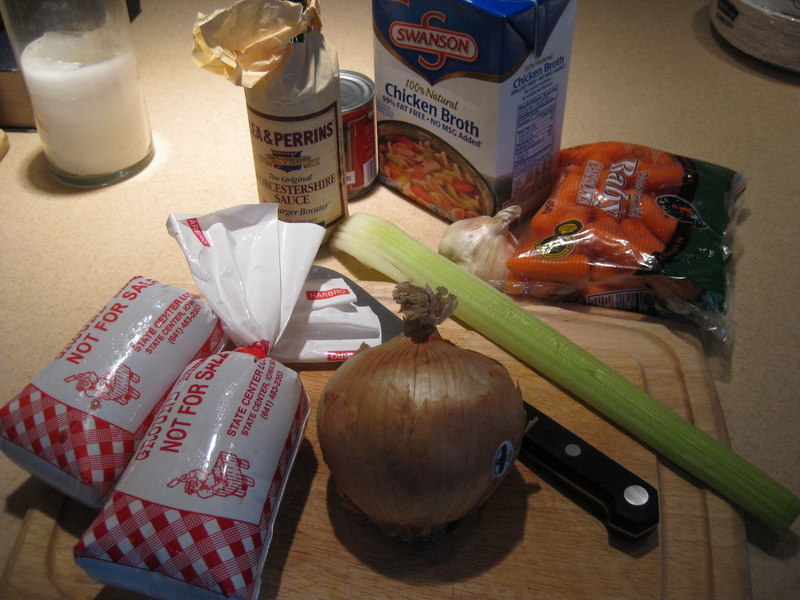 Toss this mixture with some flour to help thicken the sauce. Now all the flavor: rosemary, thyme, chicken broth, Worcestershire sauce, and tomato paste. Cook for 10 minutes or so and then add the peas and corn. And into the baking dish it goes. Now the filling gets covered with the mashed potatoes. The potatoes go all the way over the edges to seal in the filling so it doesn’t bubble over. Of course mine bubbled over anyway. Bake at 400° for about 30 minutes or until the potatoes have started to brown. Let the pie sit and cool for a full 10 minutes. This ensures that the sauce inside will thicken nicely. The classic seasonings of rosemary and thyme made a savory sauce of familiar meat-and-potatoes flavors. The pie was delicious and like many items on the list, made easy lunch leftovers. I added a little sour cream on top when I reheated for lunch at work, which was fabulous. UNFORESEEN BONUS: The concept of this dish is easily applicable to numerous different meat and veggie combinations. Hello, day-after-Thanksgiving dinner! I cannot confirm whether the pie is best enjoyed on a hillside, but I can see why the English, both shepherds and “regular” English, flock to this dish. Simple ingredients. Familiar flavors. Perfect on a rainy day. Btw- The “flock” pun above was totally unintentional. Even better.